Unless you’ve been living under a rock, you know that urban agriculture—the practice of cultivating and distributing food in population-dense areas—is all the rage. As Americans learn more about our food system and how it affects our health and the environment, many city-dwellers are looking for alternatives to pesticide-laden fruit and vegetables, GMOs and CAFOs. In response, many farmers have turned to cultivating in cities to meet the demand for locally grown crops. And ordinary citizens are taking it upon themselves to learn how to grow their own food. This is wonderful not only for the earth, but also for social and economic independence. But can this way of growing food actually sustain the human population, which is growing exponentially? That remains to be seen. It’s tough to get accurate statistics on how much food is being grown indoors, on balconies and in private gardens. Seedstock took a look at urban agriculture in five major U.S. cities to see what issues they face as they try to feed themselves. Here’s what we discovered. One social justice issue surrounding urban farming using land that could otherwise be used for housing. It’s no secret that many San Franciscans who have lived in the city for decades are now being forced out as real estate process skyrocket, so the issue is especially contentious in the Bay Area. In 2014, San Francisco became the first city in the nation to offer property owners a financial incentive for urban farming. Owners of unused lots can save thousands of dollars a year in property taxes in exchange for allowing their land to be used for agriculture projects for five years or more. The move is not without its detractors; some say these parcels would be better used for multi-family dwellings. On the other end of the scale, some cities have large amounts of vacant land. Using these plots for urban farming could not only help beautify the city but increase property values and community morale as well. A 2010 study by Michigan State University evaluated the potential of Detroit to feed itself. It found that to feed its residents, Detroit would need 5,000 acres in active cultivation, which is about 30 percent of the city’s vacant land. 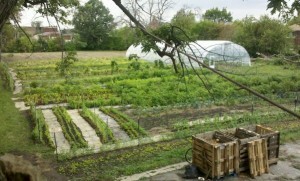 Could the Motor City morph into a mecca for urban farmers? It’s possible. Philly is an anomaly, as it’s an urban area where the number of community and “squatter” gardens has significantly decreased in the last twenty years. In the mid-90s, there were 501 community gardens in the City of Brotherly Love; in 2008, only 226 remained. Still, those remaining gardens produced about 2 million pounds of summer vegetables and herbs that year. What caused the decline of urban gardens? Many of the pioneers of Philadelphia’s urban gardening movement in the mid-20th century were minorities from the South, Puerto Rico and Asia who migrated to the area after World War II, and who grew food as part of preserving their cultural heritage and traditions. That generation is now gone. Concurrently, support for the city’s urban gardening programs was almost entirely dismantled starting in the late 1990s, and the focus shifted from community gardening to public landscaping and other beautification projects. If you think Starbucks is on every corner in NYC, you might be surprised that urban farms and gardens outnumber the popular franchise locations three to one in the city. You might not think “farming” when you think of the boroughs, but NYC is helping lead the charge when it comes to urban agriculture. One shining example: In 2013, Gotham Greens partnered with Whole Foods to create the nation’s first industrial-scale greenhouse—20,000 square feet—on the roof of Whole Foods’ Gowanus, Brooklyn location. The operation provides food for 27 Whole Foods locations in the tri-state area. This model could be an inspiration for how we grow commercial food crops in the future. A University of Washington study released in January 2016 indicated that a mere one percent of the city’s residents could be fed a vegetarian diet by food produced solely within city limits. That number would increase to four percent if all the city’s available green spaces were converted to gardening plots. But that would mean giving up all public parks. Researchers used 3D data that inputs topography, tree cover and even the height and leaf density of individual trees to get these numbers, and determined that only 6,000 residents could be fed with backyard gardens; 24,000 with green space. Sounds depressing, right? Well, not so fast. This data may be misleading because it doesn’t take into account things like rooftop gardens, greenhouses, SPIN farming and vertical farms that can produce an astonishing amount of food in relatively small spaces.